After getting a sneak peak of Carol Gordon Ekster’s book, Before I Sleep, I Say Thank You, and recently featuring this story in a blog post, I’m now excited to share her interview answers with you on THE day of her book release! As you make your Christmas list, include this book for the kids in your life. They will thank you for it! I taught elementary school for thirty-five years. This desire to teach since I was very little, playing school, and acting as a monitor for my first grade teacher, has shaped me into who I am. Teaching is at the center of my soul. And I always loved books and used picture books to enhance all areas of my curriculum. I’d start a math lesson with a picture book, reinforce concepts learned in a social studies lesson with a picture book, or read a picture book to deal with a social problem that would arise in the class. I combined my love for teaching with my love for books at the perfect time in my life when I’d have time for a second career, just as retirement neared. I didn’t know it at the time, but all those experiences were leading me to where I am today…a children’s author. About 12 ½ years ago, it came like a demand and a surprise. I started writing my first manuscript on a beach, on post-its! And I haven’t stopped writing since. My first book published, Where Am I Sleeping Tonight? (A Story of Divorce), was the 20th manuscript that I wrote. I saw a call for submissions in the SCBWI Bulletin from Boulden Publishing. They publish books for school counselors. At the time they published mostly activity books and other resources, but were looking for picture books on divorce, family issues, etc. to expand their line. I had a manuscript about a shared custody situation. I sent it in and it was acquired. It took about 3 ½ years from the time I had started writing to get a contract. My new book, Before I Sleep: I Say Thank You, released January 1, 2015, is my third book published. I also have my first e-book coming out in March with Schoolwide, Inc. as part of their digital library. And a story that I had wanted to be a picture book, “The Library Is The Perfect Place”, was acquired as an on-line resource for LibrarySparks Magazine. Oh, that’s like picking a favorite child! I can’t do it. Every time I start a new manuscript I fall in love with it. As it gets submitted and rejections come back, I get a little less attached to it, and move on to the next manuscript. But I do persevere and keep submitting most of my more than sixty manuscripts. Well, I don’t have a favorite book, but I am partial to the character in my second book, Ruth the Sleuth and the Messy Room, because it’s my mom’s name. She doesn’t stop looking for something until she finds it. Also, after all the years I taught and experienced children unable to find things in their messy desks, I know how important the skill of organization is. If you are organized, you are happier and less stressed. So Ruth, because of what she helps children realize through the story, is a favorite. Everywhere! I listen to snippets of conversation. Stories come to me while I exercise, or when I am sleeping. Ideas are plentiful. But great ideas do not come as easily and they need time and patience to craft and develop. From the time I started with the idea and draft, it took about two years until it was acquired, and another two years until I held the book for the first time. But it went through many revisions from that first draft because of input from critique partners and editors. Publishing is a business that takes time and patience. Go after your dreams and never give up. Find books you love and write stories or keep a journal. You’ll have your writing to remember who you were and what you thought years later. Work at your craft. Join SCBWI. Go to conferences. Read all you can in the genre you want to write. Persevere! I have a daily yoga practice. I love zumba dancing and riding my bike, and I enjoy traveling, especially to visit my daughter and grandson. I’ve picked this sweet part of my newest book that establishes a goodnight routine incorporating saying five things you are grateful for before sleep. And research tells us that saying thank you can put us all in a good mood! “Mommy clasps her hands behind her and I hook on to them. She’s the train and I’m the caboose. “Like” Kidsbook Friends on Facebook and/or subscribe to http://www.kidsbookfriends.com to receive blog posts directly to your e-mail. 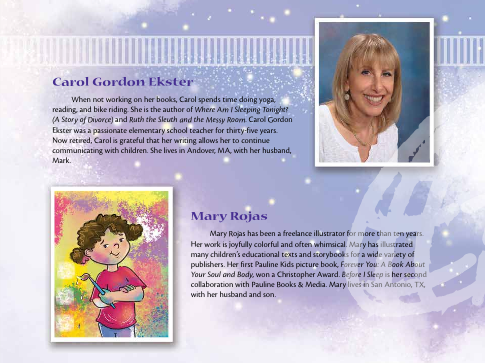 This entry was posted in Author Interview and tagged Bedtime book for kids, Before I Sleep I Say Thank You, Carol Gordon Ekster, children's book author interview, Mary Rojas. Bookmark the permalink. Great interview, Carol and Angela! Carol, I love how writing demanded you to start telling stories! It seems to happen that way for so many people! Grab what you can…post-its, napkins, receipts…. and start writing! 🙂 It truly is magical!